8 is my lucky number: I love laminating! My color coded conics! A big shout out to our librarians for all their laminating! I love them and I love laminating. I may be the only teacher who uses it, but that is okay. I made some foldables for each conic according to our book. 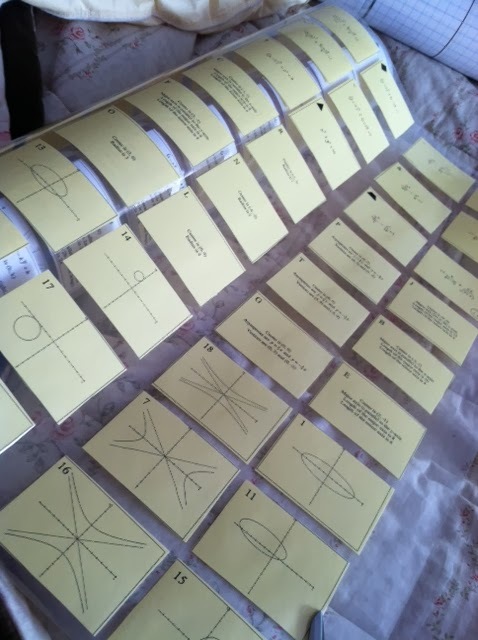 The kids will find them out the night before and come to class ready to do the conic cards and some practice. Almost flipped but not quite. And, I will do some wax paper with parabolas. I also laminated some graph paper so we can put it on top of some cardboard, add tacks and string to make ellipses. Finish it all off with this conic project from Bob Lochel: Conics Project My kids love using desmos and are getting better restricting their domain so I think this will be great. I can't wait to see how creative they are. This full lesson came together with all the help of blogs - I love it! Ooooh! I can't wait to hear about making the ellipses with tacks and string! And, I like the idea of finishing off with a conics project. That's definitely something I want to add next year!